The ENERGY STAR label is primarily intended for products to be installed in residential applications, though some commercial grade light fixtures are included in the program. 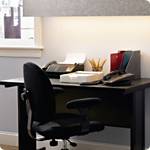 Most lighting products used in open-plan offices, warehouses and other large commercial or industrial spaces are not labeled by the ENERGY STAR program. EPA encourages building owners and operators to consider lighting design as part of the overall building system and offers ENERGY STAR Portfolio Manager energystar.gov/benchmark as a means for tracking and evaluating the impact of energy efficiency improvements – including lighting upgrades on building performance over time. High-performing commercial lighting products in the categories below are eligible for ENERGY STAR qualification. Accent and task lighting with clarity. 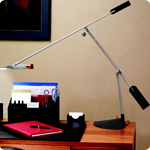 Great for illuminating work spaces and showcases. Thin, low-profile design, easily mountable. 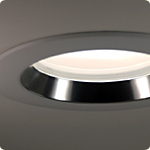 No wasted energy or light — unlike a bulb inside a recessed can. Dimmable when paired with a compatible dimmer switch. Reduces cooling costs, by producing far less heat. At least 25 times longer lasting than incandescent lights — no bulb changing. Clear brilliant light where you need it, without the heat.